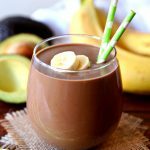 This creamy Avocado Chocolate Peanut Butter Smoothie recipe tastes just like a decadent chocolate milkshake with all the guilt. You won’t even realize that it’s actually a healthy smoothie. Add all ingredients to a blender and mix until smooth. Add additional almond milk if smoothie is too thick and continue to blend until smooth. Store leftover smoothie in an airtight container and refrigerate for a day.